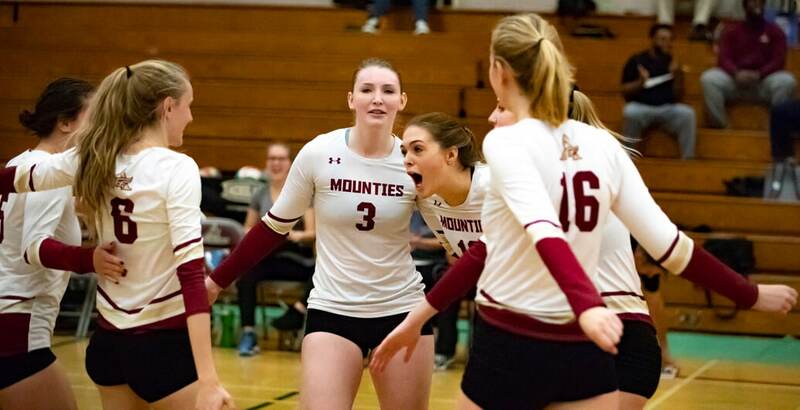 The Mount Allison women’s volleyball team has had a strong start to their 2018-19 season, successfully winning seven of their nine games. The Mounties currently stand second place in the Atlantic Collegiate Athletic Association (ACAA) league, with 77.8 per cent of their games resulting in a win. The Mounties are ranked directly under Mount Saint Vincent University, who they look to play twice more in the upcoming winter season. Rachel Van Gestel, a fourth-year commerce student, has been a major contributor to the Mounties’ success as the team’s captain and power. Out of the 16 players on the volleyball team, nine are returning members of last year’s team, while seven are new to the roster. “We have a pretty much even split between competitive rookies and dominant returning girls,” Van Gestel said. Among the new additions to the team are first-year biology student Jadyn Boyles, first-year science student Sophie Landry and first-year science student Anna Manuel. Boyles has been playing as a power and is currently the top leader in the ACAA league for service aces per set. Landry is ranked second in the league for assists per set, and Manuel is third for hitting percentage. Emily Burbidge, a fourth-year biology honours student, has been playing on the volleyball team throughout her fours years at Mt. A as a libero and power. “I would for sure say this is the strongest, most skilled team we have had since I began playing here four years ago,” Burbidge said. The team has demonstrated adaptability this season, using diverse combinations of players to adjust to each game. Van Gestel said she is also looking forward to the second half of the season. “We’ll be facing a lot of teams for the second [or] third time, and it will be exciting to face teams gunning to take a win from us,” she said. With their current record, the team looks optimistically to the rest of the year. “We have the goal of bringing home an ACAA banner this year, and with how we have been playing so far, I believe we have a great chance,” Gillespie said.